Tonight I am not here to talk about (or drink) some standard Evan Williams. 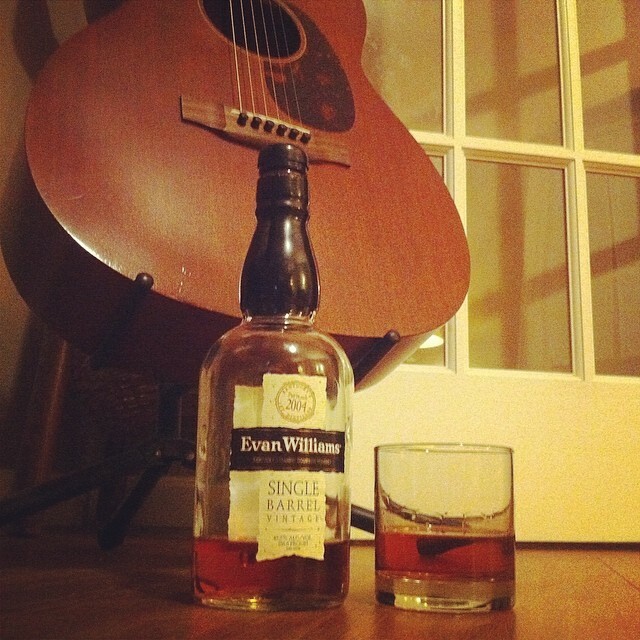 No sir, I have moved slightly up in the world, and this evening I tipple Evan Williams Single Barrel Vintage. After 9 years in the barrel this juice is bottled at 86.6. I can even tell you this bourbon entered barrel 184 on April 2, 2004 and was put in glass on December 2, 2013 and sealed in wax. Then I came along. To be perfectly honest, I went into this purchase a skeptic. This bourbon has garnered an excellent reputation, which didn’t jive in my mind with that day I woke up covered in spatter from the hatcheting open of a can of campfire ravioli. Well, one sip, skeptic no more. On the nose this is remarkably warm, rich sugar dominates with vanilla and a bit of toasty oak, like sweet molasses cookies baked in a wood fired oven. On the palate the impression only grows, with a nice slick body that spreads notes of spice, caramel, pear and honey. The afterglow basks on the tongue with a warm baked cinnamon apple flavor and a light tinge at that back of the throat that turns my stomach into a warm furnace as it finally hits home. It’s quite evident that this 9 year old version of Evan, despite being only 2 years older is miles ahead of its kin, and in competition with some of the heavy hitters of the bourbon world. The killer? This bottle is only $25. Okay, admittedly that’s about twice its 7 year blended little brother, but this hasn’t caused a voodoo hangover yet and it’s quite simply luxurious to drink. Summary? Buy, buy, buy—at $25 a bottle I’m only a raise or two away from this being a daily drinker. Dateline: Chicago, 1928. Eight years ago the manufacture and sale of alcohol were banned by Constitutional Amendment. People are so desperate for a buzz they’re drinking rub alcohol. Goddammit, they’re so high and dry they thnk Canadian whisky is good, poor bastards. The man making his fortune off this prohibition? Scarface Al Capone, former New York street bulldog, part time psychopath, full-time gangster. When you run the most notorious liquor operation in the country like Al does, you have your pick of the litter. Mr. Capone, he drinks the high class domestic product. Not some hillbilly heat moonshine full of wood alcohol and kerosene, but Iowa’s finest, Templeton Rye. Flash forward to today and the Rye that Templeton once only cooked up illegally is now paying its dues to the revenues and has gone legal. This new incarnation of the speakeasy legend is steaming off a prohibition era recipe, and playing big on its underground heritage. Beyond their reminiscences of Prohibition legends and all that jazz age hokum this new Templeton is earning a new reputation in its modern incarnation, winning numerous spirits awards, including consecutive Gold medals at the renown San Francisco Spirits Tastings in 2009 and 2010. But what do I care about gold medals? When it comes down to it, bathtub gin or Templeton, what ot comes down to is hooch in the glass. What comes in a glass of Templeton? Whiskey fit for a bootlegging magnate, Capone had taste if this is what the old boy was drinking. A wonderful and tantalizing nose of cinnamon, peppercorn and hefty brown sugar wafts draws you into a deep and complex first sip, with rye that goes beyond just that young cinnamon burn and almost widens across the palate to reveal a hearty dose of oak that can only have come from years of patience. This rye is clearly well crafted, which is a stunning feat for such a young brand but the secret, I suspect, is that the folks at Templeton had a stroke of genius—they used a proven recipe. Clearly they did everything else right, but to me the greatest genius of this product is that they took a recipe for a superior product that was unused, and made a superior product. Also, I must say, the buzz is probably better than rub alcohol too.